I am a strong believer that reading is an important life skill that needs to be cultivated as young as you can. The desire must be stirred and kept going by engaging in books that kids not only love, but can interact with. Through my association with US Family Guide, I was chosen to review Pepper the Parrotfish children's book. This book is adorable! And it carries a great message. First off, it came in hardback (a personal favorite of mine). The high quality is very evident with its glossy cover and great pictures that match a friendly, but easy to read, story. 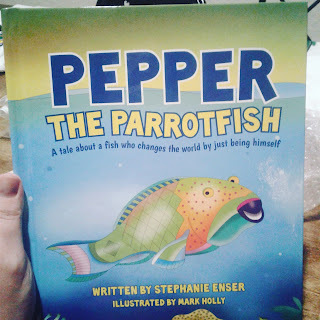 The Author, Stephanie Enser and the Illustrator, Mark Holly are both locals of Colorado and they created this book to teach children the importance of caring for our oceans. Growing up in Florida, I absolutely loved the beach. Sand between my toes, waves that could sing me to sleep and the sun overhead (that sometimes bit me hard...). But did you know that there is a creature in the water who makes sand? A very special kind of fish, actually. A parrotfish. They eat algae from the reef, keeping the algae levels at the right amount so as not to make the algae sick. But as they eat some of the algae, they chomp down on coral as well. After getting the nutrients they need, out comes - SAND! Yep, he poos it out! While he isn't alone in this ability, he does make the most of it. This easy to read book is geared towards 3-8 year olds, but even my 10-year-old liked me reading to him. What did my kids think about it? I made this a time to read with them so that we could interact on what they were learning from it. Of course, my oldest thought the best part was how Pepper poops sand. But they all had something to say when I had a discussion after reading it. Check out the video! Why is this book worth getting? 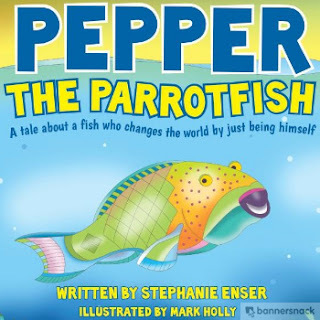 Besides a magnificent book that children can love and learn from, your purchase will also help with marine conservation. Pepper The Parrotfish is swimming to your door with FREE SHIPPING for a limited time only. Use promo code FREESHIP at checkout. And let me know in the comments below what you like about this book! Know any 3-8 year olds who would like it?